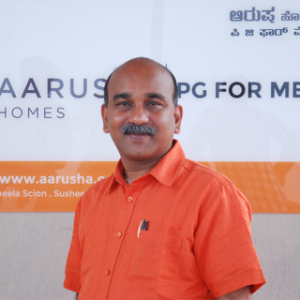 An urban sector professional with 25 years of experience structuring housing and urban infrastructure projects across India, Asia, and Africa, Satya has served as CEO of Aarusha Homes since founding the social enterprise in 2007. 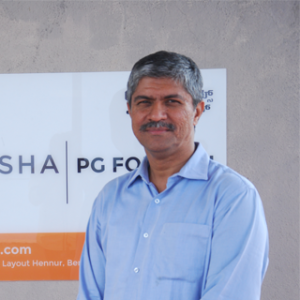 From 2004 to 2007, Satya served as a Project Finance Advisor to the United Nations Human Settlements Programme (UN-HABITAT) Slum Upgrading Facility (SUF). Based in Nairobi, Kenya, Satya helped developing countries in Asia and Africa attract domestic and commercial capital to finance slum and urban upgrading activities. Prior to UN-HABITAT, Satya worked as a Senior Infrastructure Finance Advisor at the Indo-USAID Financial Institutions Reform and Expansion (FIRE) Project. At FIRE Project, Satya provided technical assistance and training activities focused on slum upgrading and urban infrastructure development and finance. Satya is a Civil Engineer and holds a Masters Degree in Housing from CEPT University, Ahmadabad. He is also a member of GOI Task Force on Rental Housing. Dyan has twenty three years of experience in designing and managing Housing projects (residential, large institutions, environmental/heritage conservation and hospitality sector). He is an Architect with Masters in Urban Planning from CEPT University, Ahmadabad.